So I'm a big John Lennon fan. Not so much for his music as I am of the ideas that he sometimes presented through his music. He wasn't a perfect man. He definitely enjoyed his drug use, for example. He also possessed a hot temper, and had some dealings with women I look down on. However, I feel as though his impact on the world is still felt today. 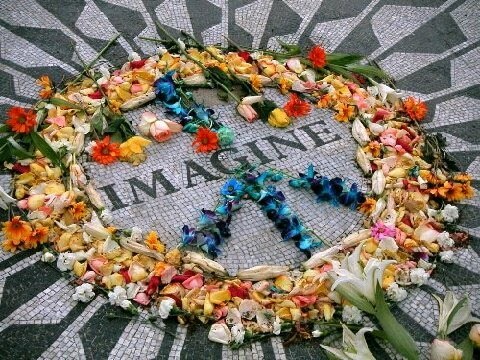 Thirty years ago today, his life was senselessly taken by fanatic Mark David Chapman. Even ESPN's Outside the Lines did a piece on Lennon's killing. As I said, his music isn't really what I am a fan of. In fact, much of his solo work is very sub-par. On occasion, though, the brilliance would come out and produce musical wonders. Three of them are here today. I think we all know two of the three. The first was an anthem against the Vietnam War and helped solidify Lennon's being booted from the States by Richard Nixon. 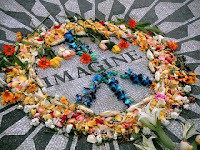 The song "Give Peace a Chance" became the anti-war song amongst anti-war songs. The second one is also anti-war but in a bit more subtle sense. Every holiday season, we hear "Happy Christmas (War Is Over)", and wonder where it came from, but it somehow seems to fit. The last is one that pushes more his ideas as an atheist, which continually becomes more stigmatized in this country by the day. No real help from the likes of Richard Dawkins and Christopher Hitchens with their tactless and arrogant delivery, however. The song "God" proclaims his disbelief in the fantastical, which smacks of a bit strange, considering his past history of drug use. People may be wondering why I didn't post "Imagine". Well, if you dig back a few months on the blog, I actually did a post on the song, and the covers of it I found to be some semblance of good. Now go buy some of the man's music! My friends made a Christmas album with a great Lennon cover. Just out my last blog post for the whole album.